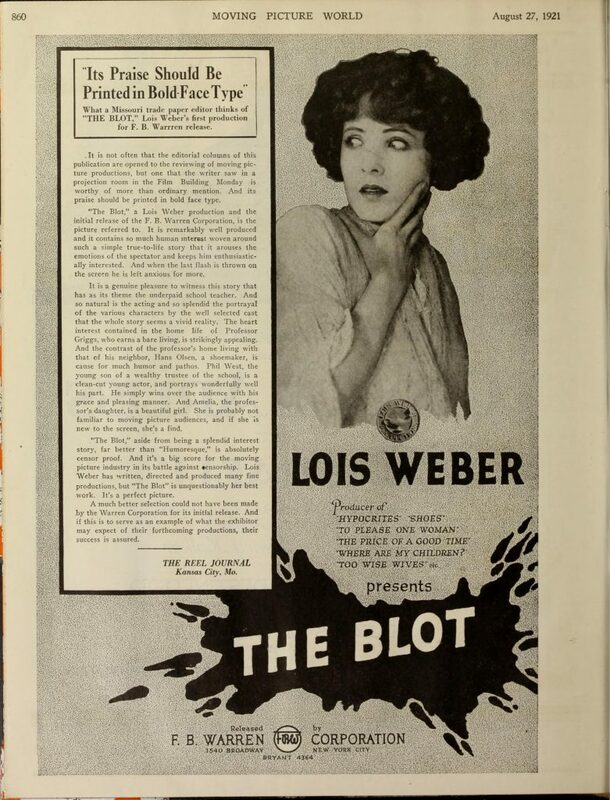 One of the great writer-directors of early Hollywood, Lois Weber’s accomplishments rank alongside those of Cecil B. DeMille and D.W. Griffith. Not only the most renowned female director of her era, she was at one time the highest-paid director in Hollywood, and sustained a career that lasted over 25 years, during which time she started her own production company and directed over 40 features and hundreds of short films. 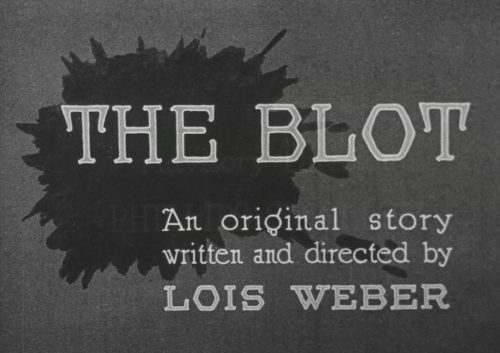 Flicker Alley’s “Lois Weber Program” consists of two of her most acclaimed silent films (one short and one feature). 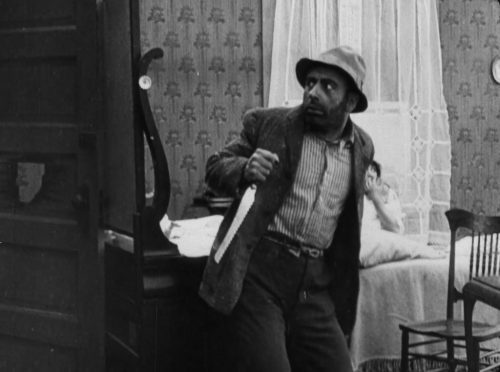 SUSPENSE (1913) – 10 min. Weber stars as a young mother who is home alone when a tramp enters her house in this visually captivating and stylistically advanced thriller. 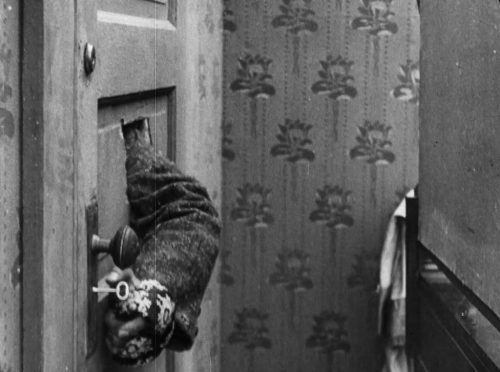 The chase scene, the use of split-screen, and the shots of the tramp ascending into the house are all powerful visuals that proclaim Lois Weber’s skill as a film director. 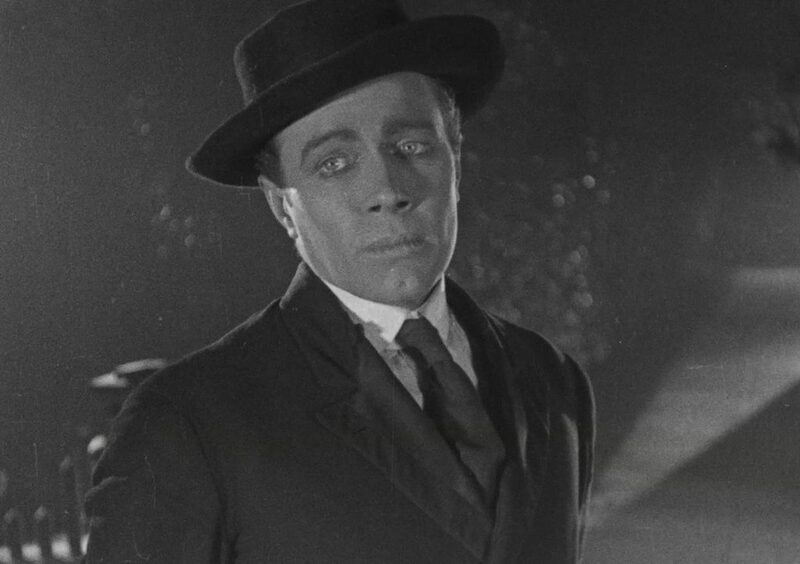 Music by Frederick Hodges. 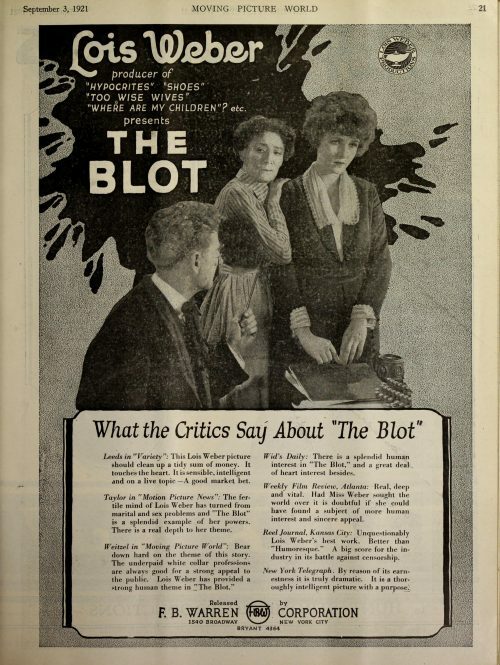 THE BLOT (1921) – 93 min. 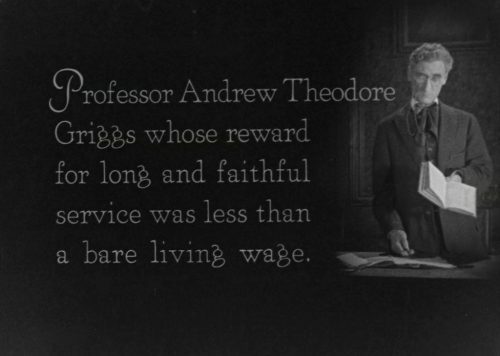 Hailed as a masterwork, this intimate drama is a biting commentary on economic inequality. Through her portrait of the Griggs family—an underpaid college professor, his long-suffering wife, and their daughter Amelia, a young librarian—Weber reveals a society where “keeping up with the Joneses” is an issue of basic nutrition rather than material possession. Weber juxtaposes social classes through the varied stations of the three men vying for Amelia’s heart: an affluent college student, a middle-class “boy next door,” and an impoverished minister. 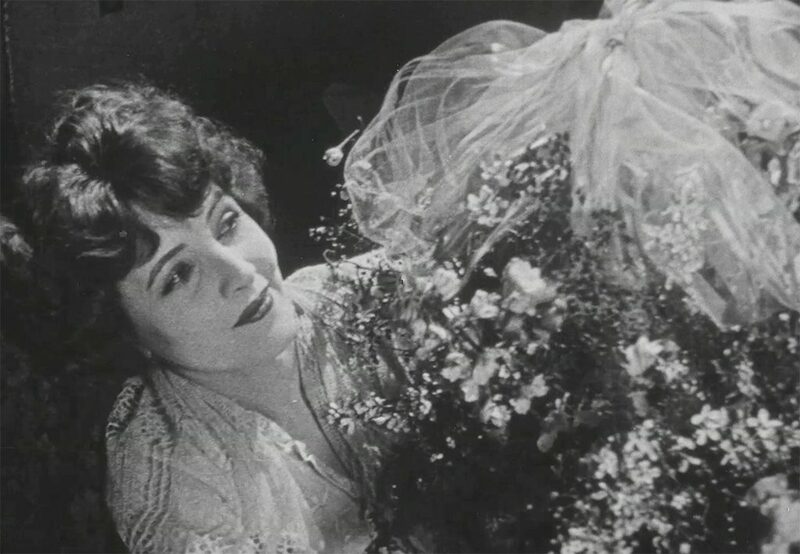 Weber’s powerful command of language in her insightful intertitles, as well as her use of close-ups and real locations, showcase her strengths as a writer and director. Starring Claire Windsor, Louis Calhern, Philip Hubbard, and Margaret McWade. 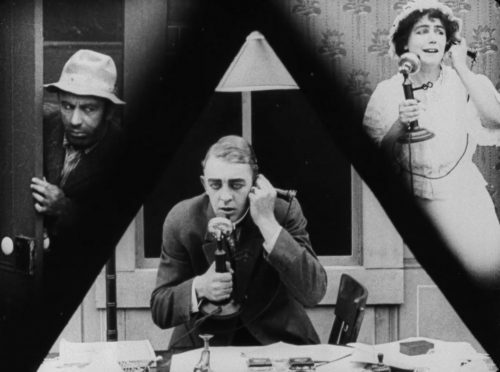 Music by Rodney Sauer and the Mont Alto Motion Picture Orchestra. 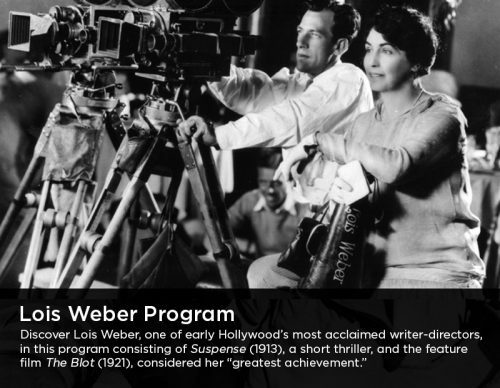 “Lois Weber Program” is available on DCP, Blu-ray, and DVD. For more information about renting “Lois Weber Program” for your theater, please click on the Request Screening button below. 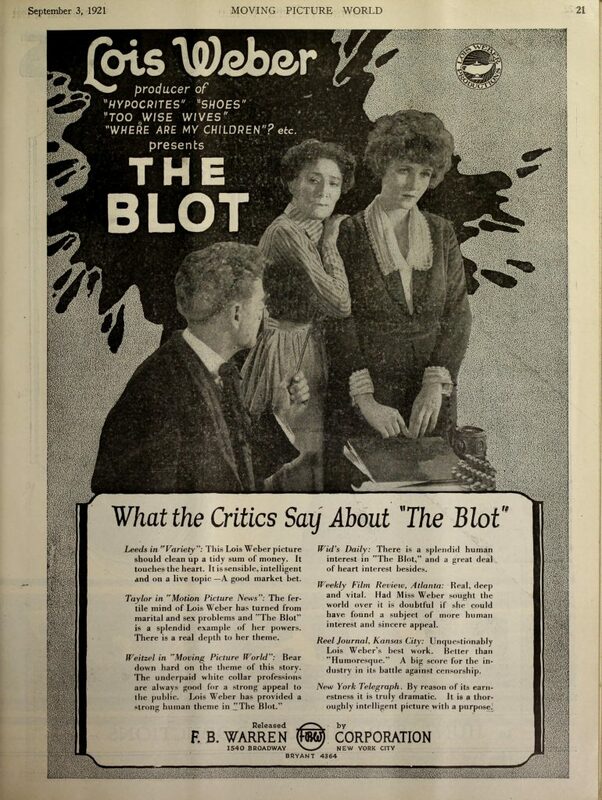 In this charming clip from THE BLOT (1921) by Lois Weber, college student Phil (Louis Calhern) gives his professor’s daughter Amelia (Claire Windsor) a ride home in the rain, causing a disturbance to both her family and his rival for Amelia’s affections.